The famous French shipbuilding group DCNS is working on the development of SMX models ranging from serious proposals to vapourware concepts - basically "what could we do" studies. The SMX-23 and SMX-26 are small ships, while others are large capable submarines. The vast majority of Naval Group concepts of this type have not been implemented yet, because these are to show the industry's possibilities and their visions of the future, and not be a response to the current needs of navies. 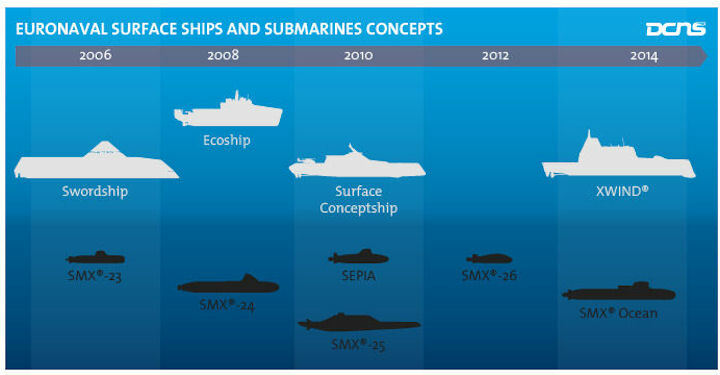 The exception was so far SMX Ocean, which is a conventional variant of an atomic Barracuda type ship offered to Australia as Shortfin Barracuda Block 1A and selected in April 2016 under the SEA 1000 Future Submarine program worth 38.7 billion USD. Typically submarines from the middle and higher class are difficult to operate in narrow seas, many canals, depths of 50 m (depth enough to launch missiles or torpedoes). Typically, medium-sized submarines operate easily in areas of at least 100 m depth. 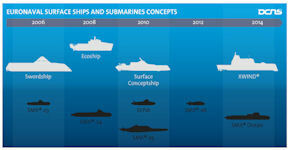 Under conditions of shallow marine environment or coastal areas, many boats, submarines or mini submarines will take full advantage of them, as an effective complement to large submarines. Combat operations in deep water and flat terrain. Automobile companies use “concept cars” to gauge public reactions to design features and decide whether to produce on a bigger scale. There is intense pressure on the manufacturers and their suppliers to innovate and to reduce production costs through the adoption of new technologies. Concept cars features striking designs characterized by aerodynamically efficient and curvaceous fluid lines. Inside, the styling is equally futuristic. The costs of innovation are very high. For example, the total cost of developing a new vehicle from concept to prototype may be hundreds of millions of dollars; moving it from prototype to production typically costs billions more. Like the automakers, the shipbuilder presents at the military naval show prototype models ships that bring together all its know-how. It foreshadows the innovations that will appear in its future range of ships. Each year at the EuroNaval exhibit, DCNS presents a concentrate of its axes of innovation and know-how in the field of ships, in the form of a 'Concept-Ship'. DCNS has used the Euronaval exhibition in Paris to unveil its concept ships, combining all of the Group's main innovations for future naval systems, which it will use to help mature various technologies for future platforms. Most designs remain concept ships, but they give some pointers as to what a warship might look like in the future. EURONAVAL, held at the Parc des Expositions du Bourget, is the most important naval defence event in the world. Since its creation in 1968, EURONAVAL has been exclusively devoted to naval defence and maritime security. This specialisiation in the naval sector allows it to attract the most astute industrial and State experts, and to offer a privileged venue for supply and demand of all types From the Asia-Pacific zone, the American continent and the Middle East through to Africa, order prospects are very strong, from heavily armed large warships to small fast patrol boats, covering the whole range of surface and submarine naval capacities as well as maritime surveillance. Since its creation in 1968, the French naval industry, grouped together under the GICAN (French Marine Industry Group) is at the heart of EURONAVAL organisation, via its subsidiary SOGENA. The GICAN is part of the CIDEF (French Defence Industry Council), with the GIFAS (French Aerospace Industries Association) and the GICAT (French Land Defence Manufactures Association), the three organisations that represent French defence industries as a whole. DCNS is the European leader in Naval defense. As an international high-tech company, DCNS uses its extraordinary know-how, unique industrial resources and capacity to arrange innovative strategic partnerships to meet its clients’ requirements. The Group designs, produces and supports submarines and surface ships. The Group also provides services for naval shipyards and bases. The naval defence sector has been DCNS’ core business for almost four centuries. The Group is positioned as prime contractor and integrator for whole warships. It designs, manufactures and provides through life support for the most innovative surface naval systems and submarines on the market along with the associated critical systems. In addition, the Group offers a wide range of marine renewable energy solutions. Aware of its corporate social responsibilities, DCNS is a member of the United Nations Global Compact. The Group reports revenues of €3.2 billion and has a workforce of 12,800 employees.